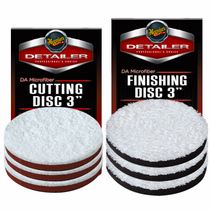 Meguiar's Dual Action 3” Microfiber Cutting & Finishing Pad Discs give you the power to maneuver small areas with your Meguiar's Professional DA Polisher or other DA Polisher. Meguiar's Dual Action 3” Microfiber Cutting Pad Disc has the power to quickly remove light to moderate defects while leaving behind a swirl free finish. For your final finishing and wax application use the Meguiar's Dual Action 3” Microfiber Finishing Pad Disc to reveal that sought after show car shine. Meguiar's DA 3 Inch Microfiber Cutting and Finishing Pads are made with an advanced microfiber technology and engineered foam interface to contour to curves as well as flat surfaces for better efficiency, control to produce phenomenal results. 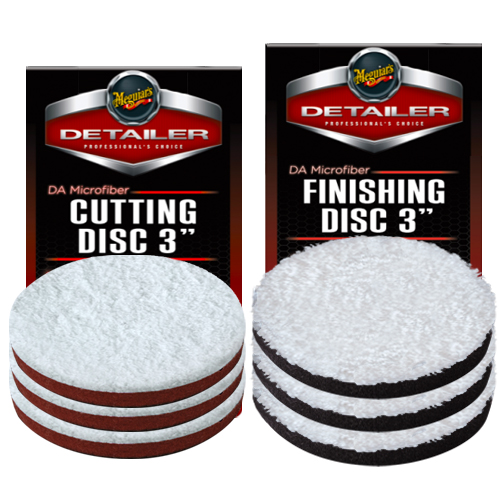 Mix & Match SIX Meguiar's DA 3" Microfiber Cutting Pads or Meguiar's DA 3" Microfiber Finishing Pads! Meguiar's DA 3" Microfiber Cutting Pad: Remove moderate paint scratches, swirl marks and oxidation with Meguiar's DA Microfiber Correction Compound. 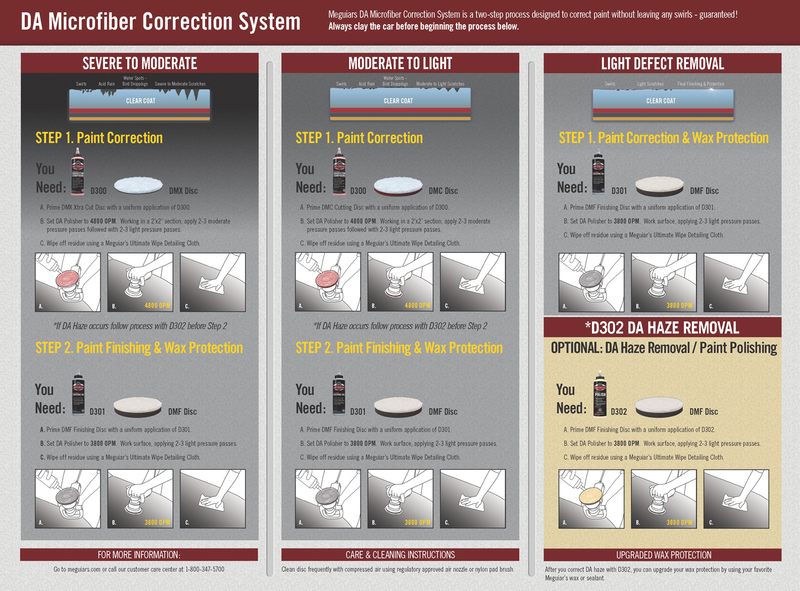 Meguiar's DA 3" Microfiber Finishing Pad: Apply Meguiar's DA Microfiber Finishing Wax or Meguiar's Ultra Polishing Wax. 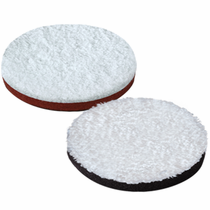 During Use: Clean Meguiar's DA 3” Microfiber Pads frequently during use with a nylon bristle pad cleaning brush. After Use: Machine wash using a mild detergent. Don't use fabric softener of any kind. Tumble dry on low or no heat. Don't use dryer sheets. To prevent contamination store in a clean, dry location or in a storage container free of dust, dirt and debris.